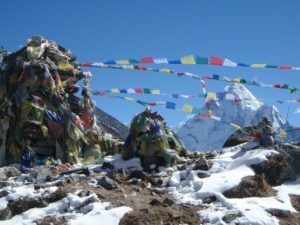 Thinking of trekking to Everest Base Camp and ticking it off your bucket list? Have questions about the trek? Let us tell you what you need to know! How difficult is Everest Base Camp trek? And how different is it from Kilimanjaro? It is difficult to compare the trek to Everest Base Camp to the climb of Kilimanjaro. There are many different ways to climb Kilimanjaro. Some routes are shorter and gain altitude quickly and hence offer little chance for the body to get acclimatised naturally. The shorter routes on Kilimanjaro have a much lower success rate than the trek to Everest Base Camp. The trek to to Everest Base Camp winds through many different Sherpa settlements and traverses a huge variety of terrain. This adds a huge amount of diversity, colour and vibrancy to the trek. The Khumbu valley also hosts some of the highest mountains in the world which provide an incredible trekking experience. Overall the trek to EBC is what it says on the tin; a trek to one of the most talked about destinations there is in the world of adventure. 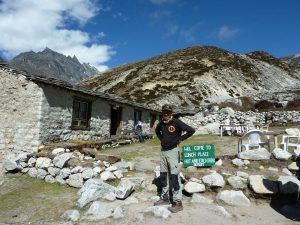 On the Everest Base Camp trek you also will find yourself stopping every few hours in a teahouse (an old Sherpa home that has been generously turned into a resting point for trekkers). Here you will either bask in the sunshine and rest in the large communal room that hosts a pot bellied stove so to warm up, giving you time to relax and soak in the vista with a hearty snack and many cups of lemon tea! On the trek to EBC you don’t have a monster summit day of 12-14 hours like you do on Kilimanjaro. 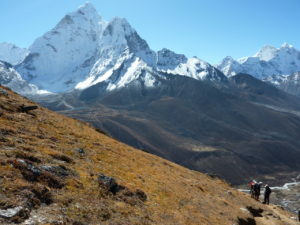 The final day’s trek to EBC is a 5 hour stunning walk that’s not all about height gain. The starting point is at 2,700 meters and EBC is at 5,400 to 5,500 meters. The highest point reached during the trek is the small (in comparison!) mountain of Kala Pattar which is around 5,550 meters, from here you can see the Khumbu and the Mount Everest in all its magnificence! The trek in takes longer to climb as it is vital for your body to acclimatize to the increasingly thin air. 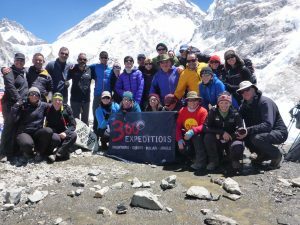 Our itinerary has been especially designed by the guides and Sherpas for teams attempting to reach the summit of Mount Everest itself. 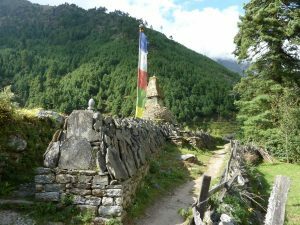 The trek has plenty of rest days which allow you to explore more of the less trodden parts of the Khumbu valley and to savour it at its fullest. If this approach works for the summit teams then you can be sure it will work for you! A highlight for this season is that for the first few days you trek through blossoming rhododendron forest adding enormous colour to the trip. What kit is needed for Everest Base Camp? Pack for every season. Kathmandu and the first few days of the trek will feel like the UK on a very hot summers day and base camp like a very cold winter day (of course all weather dependent). Do I trek with or without a guide? For a few trekkers, the challenge of reaching the base camp of the highest mountain in the world is to do it on their own terms. It is worth remembering that trekking to Everest Base Camp is not a wilderness experience. Wild-camping is not permitted and since you frequently pass through villages which are used to seeing westerners most modern facilities are readily available. 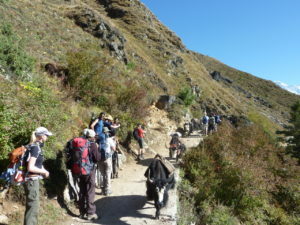 Taking a guide, whether through a local agency or better still going through a reputable company – your route will have been well crafted giving you ample rest days while placing you on a great acclimatisation plan giving you the best chance to not only really enjoy the trek but also to arrive at Base Camp itself. Experiencing the best of Kathmandu before and after the trek, playing football with monks at a monastery, standing in awe as you watch the valley from a hidden view-point, having a beer with Everest high altitude climbing Sherpa as they prepare to go onto the mountain, warming your hands in-front of a fire in a Sherpa kitchen and entering the mighty Khumbu icefall are all aspects not often experienced by solo trekkers. When booking with a UK company they will most likely be sending out a western guide. 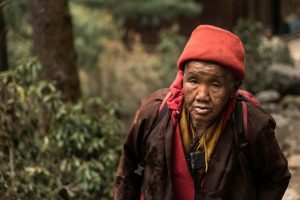 If travelling with 360 Expeditions then this guide will often be Rolfe who has climbed x4 on the 8000m peaks who brings many fascinating stories to the table with tales of wonders from around the world. 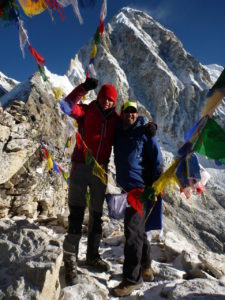 Along side Rolfe you will be accompanied by our amazing Sherpas who will add to and enrichen your experience. 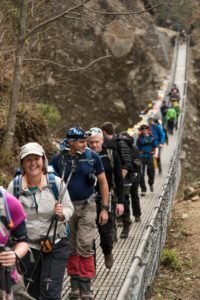 We hope you found some of the answers to your Everest Base Camp questions and that you will join us on our next trek in March with Rolfe and Berghaus, who are throwing in many bits of groovy kit.